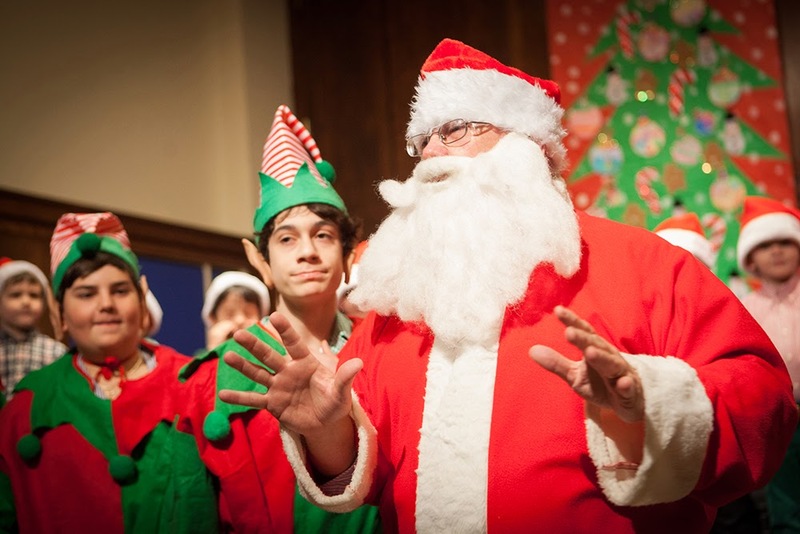 Yesterday was a special one at Saint David's as we all prepare for Christmas. In the morning, our first graders sang their hearts out at our Christmas pageant. Under the direction of Music Chair Jeff Moore, they were all wonderful: prepared, confident, happy. Below, is a brief clip of them singing Pastores y Reyes in Spanish and We Three Kings. 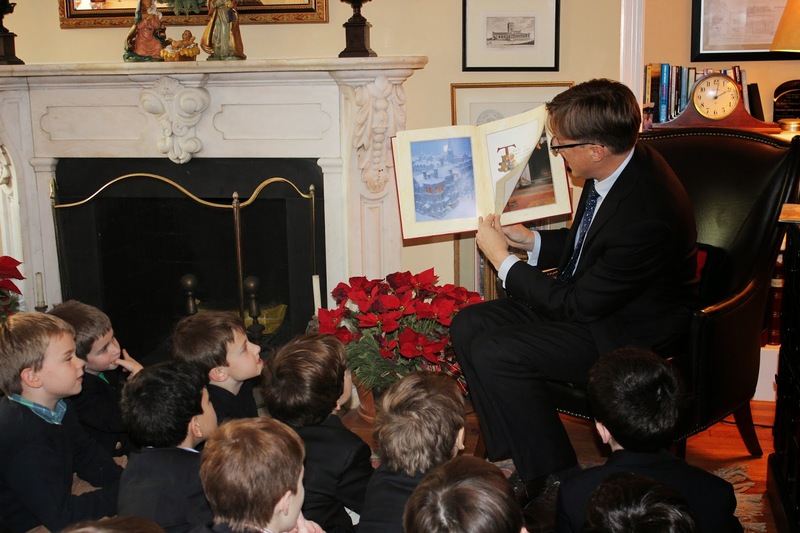 Later in the day, the Omega boys visited me for a read-aloud of "Twas the Night Before Christmas." The boys are so excited for the holidays and they enjoyed listening to this holiday classic. 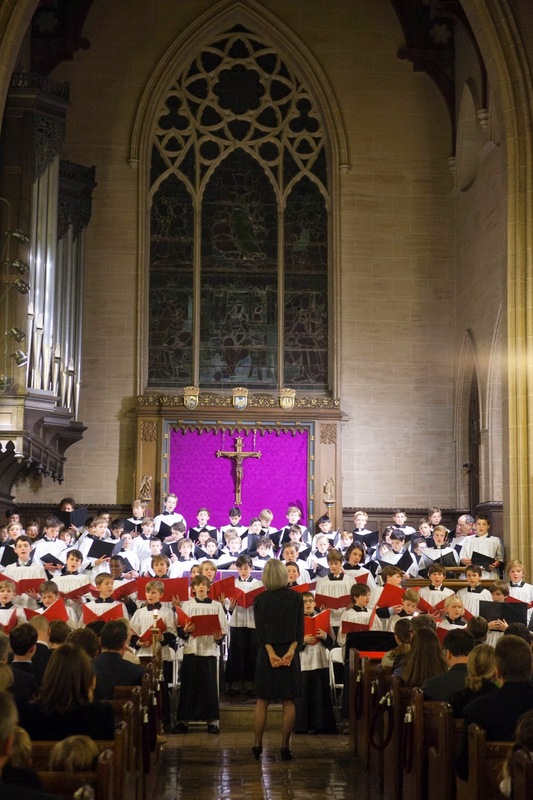 Evening brought the Recorder Consort directed by Susan Iadone, and Advent Service of Lessons and Carols, a wonderful Saint David's tradition of scripture reading and carol singing that for decades has been held in the beautiful St. Thomas More. Our Fifth and Sixth Grade Chamber singers, taught and directed so passionately by Phyllis Clark, and all of our readers brought home for all the true meaning of Christmas. 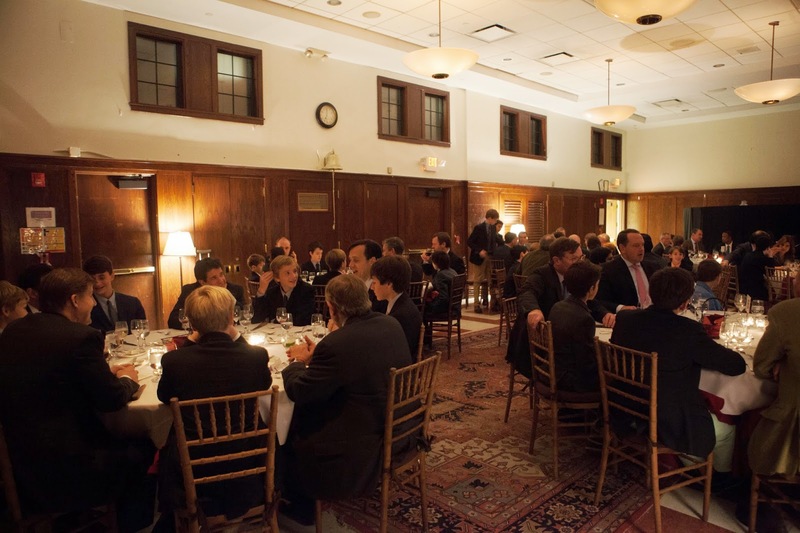 Our annual Alumni and Family Christmas Gathering on Monday evening was a beautiful celebration of the bonds of this special community of Saint David's alumni and their parents. The warm ambiance of the Hume Library is such a fitting place for such gatherings. 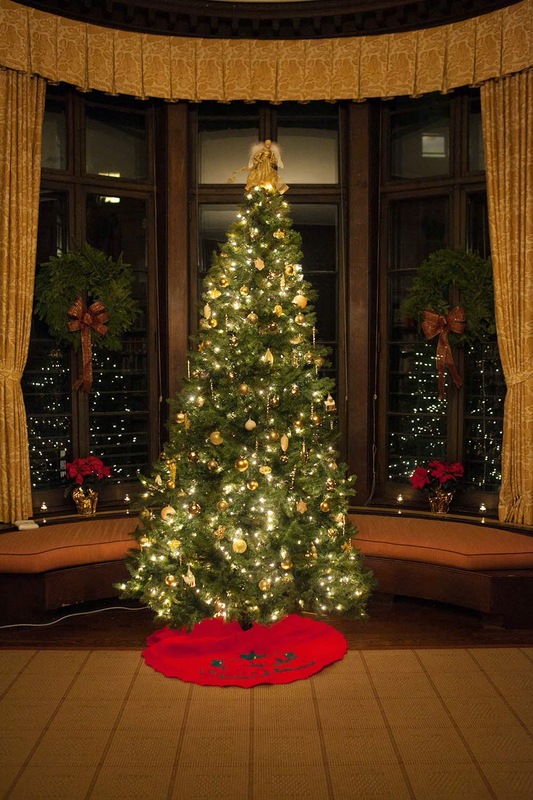 As a community we define ourselves primarily by what we choose to do together, and bringing alums and alum families back at Christmas is a wonderful shared tradition. The evening also is when we announce our Alumnus of the Year. This year's recipient is Charles Worrell '77. Charles has been an active alum, traveling far from his home in Baltimore to attend our events and remain connected to the school. 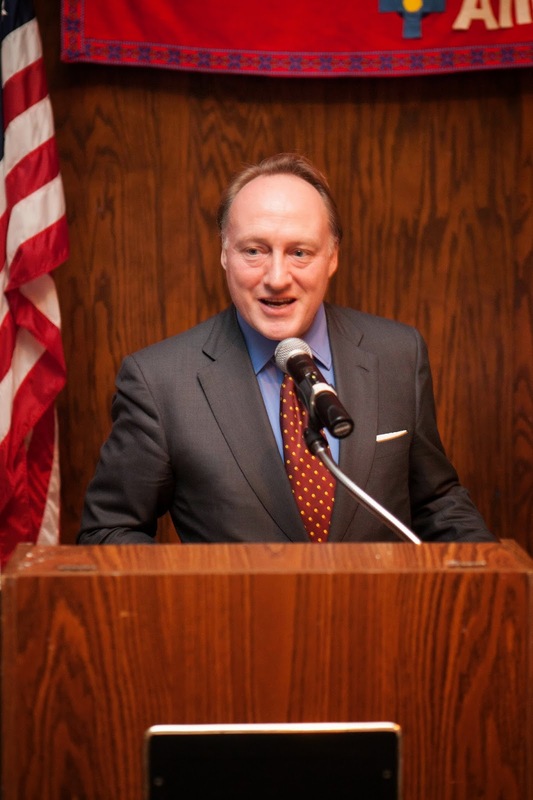 Professionally, he certainly exemplifies this year's theme "ideas and ideals" as he leads teams that develop automated tools to detect and explain financial crimes. He holds a BA from the University of Pennsylvania, an MS from the Naval Postgraduate School, and a PhD from George Mason University. Charles also served his country navigating a US Navy Destroyer. Below, is a clip of Charles's gracious acceptance speech, including his special declaration for our boys and alums. 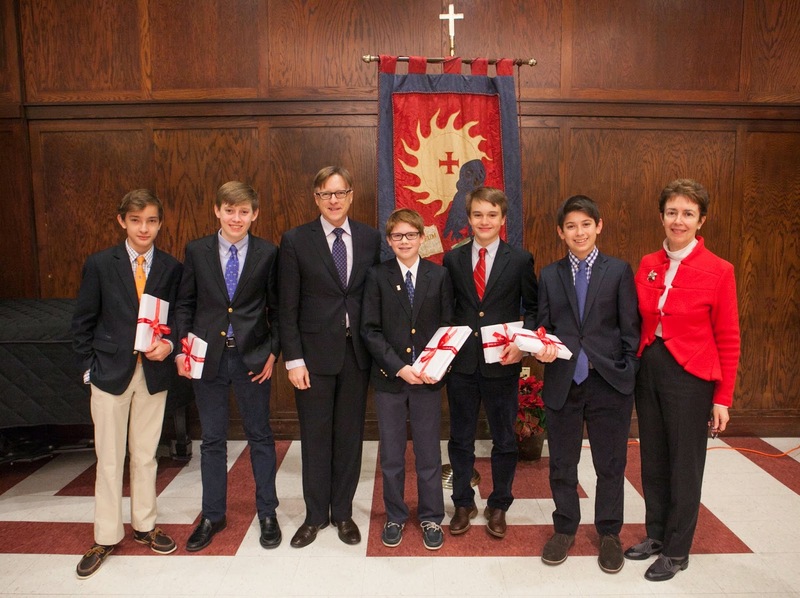 This past Friday was the Eighth Grade's final Nightingale-Bamford Lectures on Art. In this culminating humanities class project, taught by Nancy Iannicelli, our eighth grade finalists present an analysis of a work of art by a master to eighth grade visitors from Nightingale-Bamford School, and before a panel of judges that include heads of other schools, and Saint David's administrators and trustees. The seventh graders also attend in order to obtain a sense of the project they will be responsible for next year. The boys are required to prepare a lecture and PowerPoint presentation that addresses several components including, historical setting, gesture, shape, color, iconography, and balance, among others. The boys are judged on the quality and depth of their research and analysis, and also on their oral presentation skills and the design of their slides. 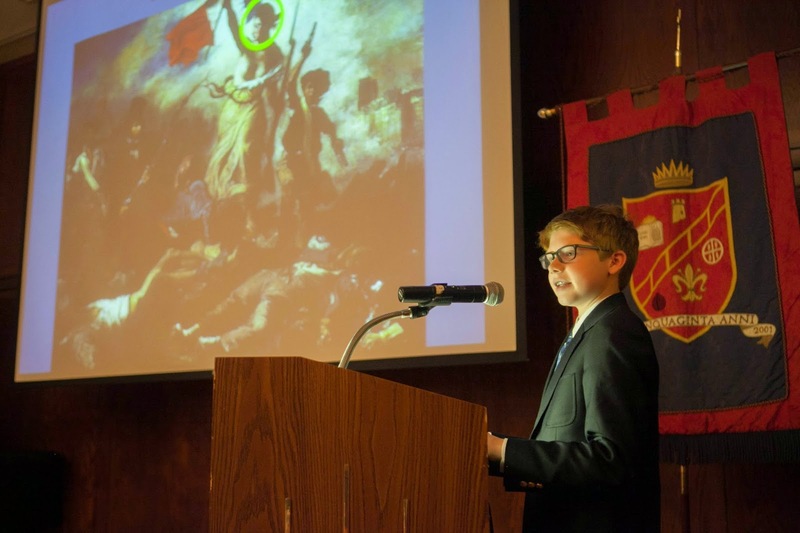 This year's winner, James H., delivered his lecture on Delacroix's Liberty Leading the People. Each year I am impressed by the variety of choices in the artwork analyzed, the depth of the boys' analyses, and their command of public speaking. It is not easy for a young man to face an audience of judges and peers, and ours do so magnificently--clearly expressing the ideas and ideals behind their work of art. 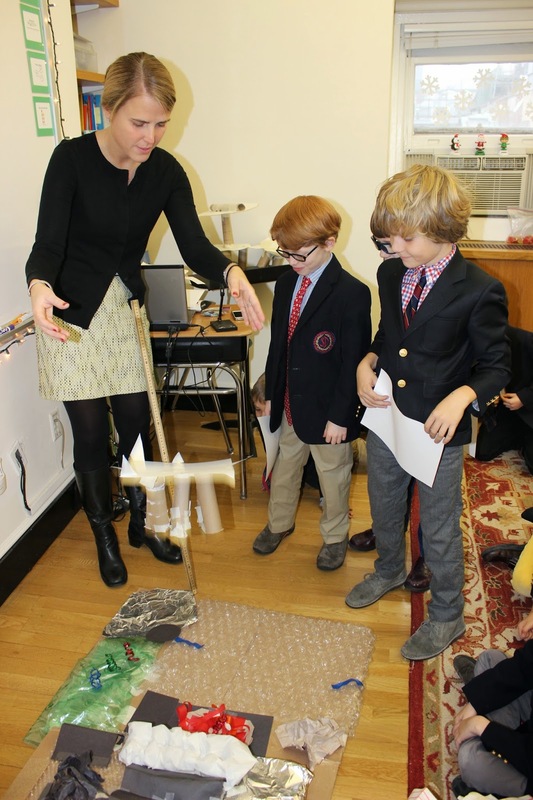 Our second graders have been on a mission, "invited by NASA" to design a prototype lander "Philae II" which could successfully land on, and explore, a comet. In math and science classes, the boys had learned about the European Space Agency's success with the Rosetta spacecraft and its 220-pound lander, Philae, which harpooned itself to the surface of a comet last month, allowing for the first extended close examination of a comet. Designed to operate through 2015, Rosetta and Philae will make observations as the comet makes its nearest approach to the sun a little more than a year from now, at 115 million miles, still outside of the orbit of Earth. Our boys were tasked with building a second generation lander, which would explore a different comet. 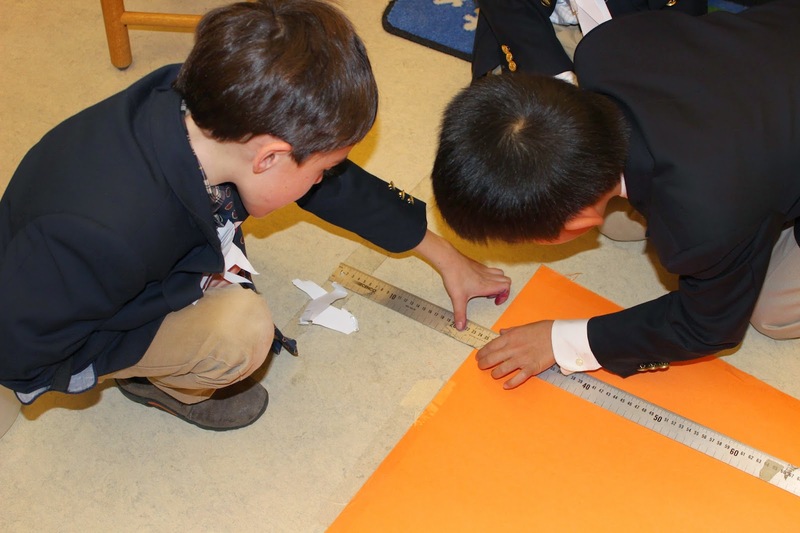 Working together in teams, the boys had free rein to come up with ideas about how to build successful probes using the following items: paper towel rolls, masking tape, measuring tape, and cardstock paper. Today the boys tested their various models by dropping them on the surface of a mock comet, which included such potential obstacles to landing as black holes, lava, and plateaus, and discussed why certain designs made successful landings on the comet's surface, while others did not (see successful landing in clip, below). This project is an example of how we combine math and science learning in active and tangible ways. For math the boys needed to measure lengths, use appropriate tools strategically, classify events according to duration of time, and be precise when making calculations. In science they learned how scientists and engineers work together, how engineers work to solve problems, and what helps objects fly and land softly. They also came to realize that engineering design is an iterative process, involving repeated rounds of analysis and testing. Last week our fourth graders visited the Stephen A. Wise Free Synagogue on the Upper West Side in conjunction with their religion studies. This trimester, the boys have been investigating the "family tree" of religions, and noticing the many similarities between Judeo-Christian faiths. The boys asked questions about the design of the synagogue and various customs, and they were even able to glimpse one of the congregation's torahs. They learned how torahs are made by modern day scribes and, much like scribes from ancient Egypt, how they could spend many years working on important documents. The fourth grade religion course introduces our boys to several of the world's major religions. 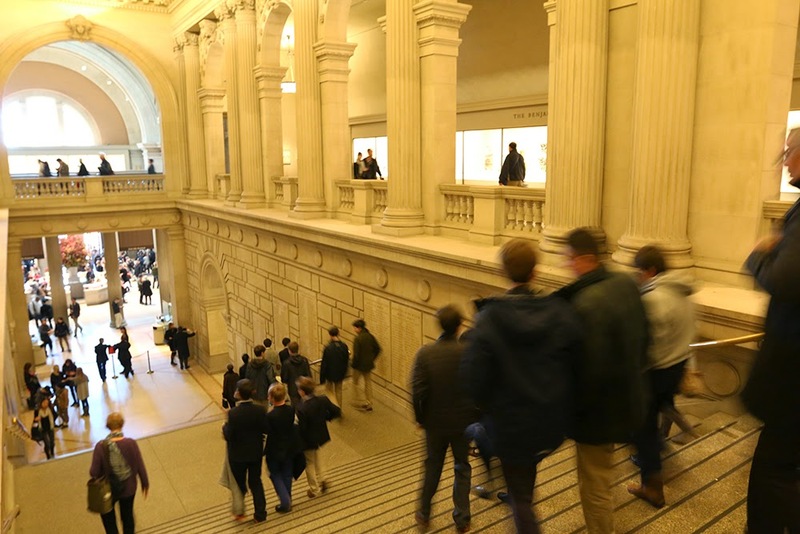 Boys in Grades Four and Eight visited The Metropolitan Museum of Art last week, one of many visits that our boys in several grades make throughout the year. As the fourth graders explored what it means to be a civilization, they visited the Egyptian Wing of the museum. There, the mummies, pyramids, Cleopatra's Needle, and all of the artifacts they encountered and discussed, deepened their understanding of that ancient civilization and helped make classroom concepts spring to life. Our eighth graders make four trips to the Met during the year, all related to their learning in the capstone humanities course. The first, in October, focused on Greece and Rome. Last week's, introduced the boys to the Renaissance, which they will explore and research in-depth this year, with a focus on how the Renaissance thinker is relevant to our conception and definition of a good man today. 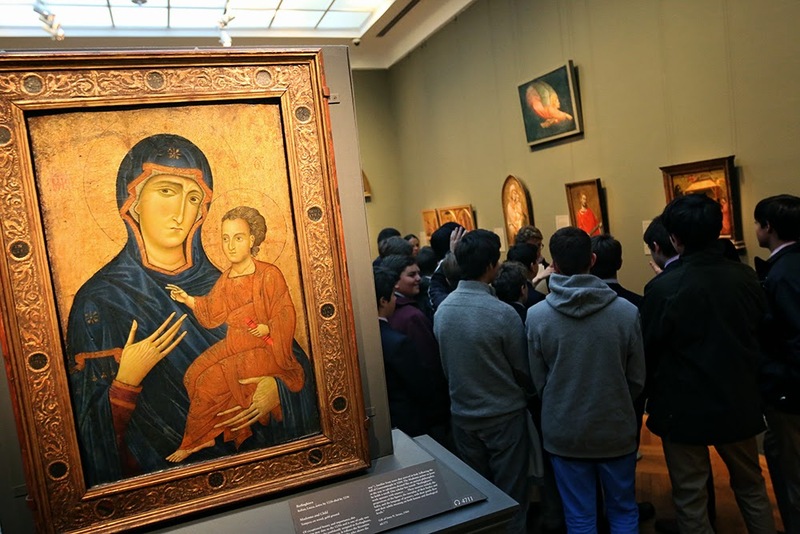 This study will culminate in the Eighth Grade Spring Study Tour of Rome, Florence and Assisi, where the boys will see works by several of the masters, like Giotto, whom they were introduced to on Friday. Enabling our boys to learn in ways that break down the walls of the classroom is a priority at Saint David's. We are fortunate by our location to be able to avail of the great campus that is New York City and we collaborate thoughtfully with a multitude of cultural, scientific, and educational institutions. Whether it be The Met, the Native American Museum, The Frick, The American Museum of Natural History, The Rubin, the N-Y Historical Society, the Gilder Institute of American History or DNALC, our boys are out and about, not just to "get out of the classroom" but because we've carefully integrated such visits to extend their learning and broaden their minds. It doesn't get much better than listening to boys in our pre-primary grades sing Christmas Carols. 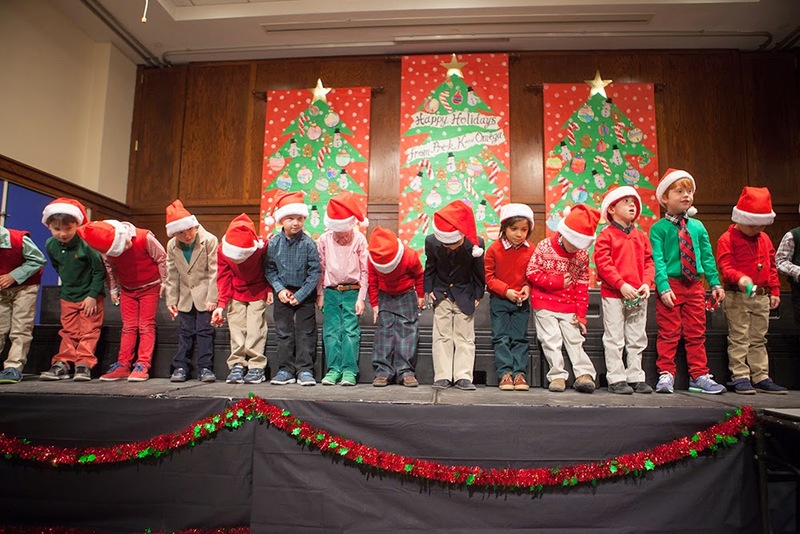 This past Friday, for our annual Grandparents and Special Friends Day, boys in Pre-K, K and Omega entertained an audience filled with their grandparents. The boys had been practicing for their big performance in music classes led by our Music Chair Jeffrey Moore, and they were ready and excited to perform. A surprise visit by Santa and his Elves delighted as well. Afterward, grandparents visited the boys' classrooms to participate in an activity with their grandchild. It is always wonderful to welcome the grandparents of our boys to school. Part of a second grade science unit on plants integrates work the boys do in science with graphing work in math class. Our boys were challenged to test the effect of different variables on the "flight" of paper and paper clip "helicopter seeds" that the boys made last week. On the first day of this project, boys dropped the paper clip "seeds" near a fan, and watched how they floated down to the floor, making measuring marks on a floor mat. The boys measured how many cm the seeds traveled from their "drop point," collected data in tables, and then used this data in their math classes to create graphs (shown at right). Based on these experiments with flying seeds, the boys next designed, built and tested a variety of different types and styles of flying seeds to see whether they could improve on mother nature’s designs. The unit will conclude with the boys making generalizations about shapes that make efficient flying seeds, and comparing them to different examples of flying seeds in nature. STEAM strands like this in our curriculum provide a wonderful opportunity to integrate disciplines in support of problem solving activities. 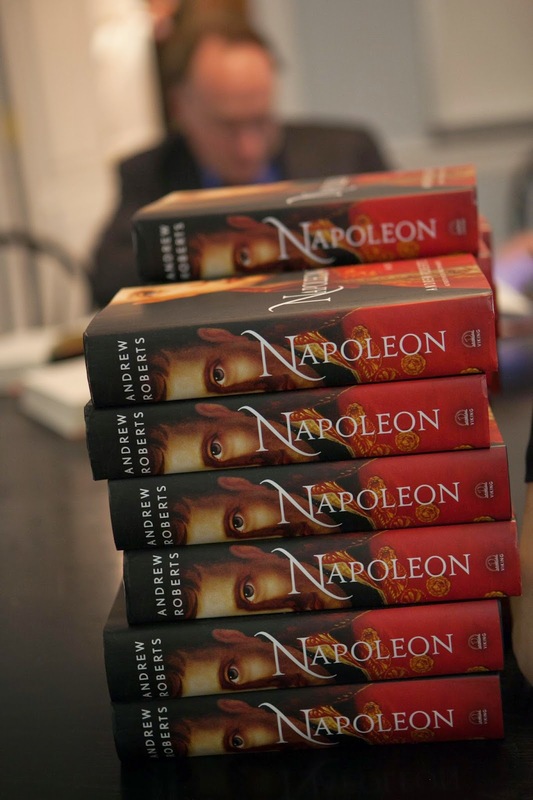 Yesterday evening, our seventh grade boys and their fathers gathered together for a special dinner and a talk by award-winning British historian Andrew Roberts, on Napoleon A Life, his new biography of the great soldier-statesman. Dr. Roberts, author or editor of a dozen books including Masters and Commanders and New York Times Best-seller The Storm of War, drew upon Napoleon’s recently published 33,000 letters in writing the book. He spoke to our boys and their dads about Napoleon as father of a nation. After speaking, he took questions from the captivated audience, and all present left with signed copies of his book. The father-son relationship is a unique and special one, and the boys and their fathers thoroughly enjoyed this time together, the dinner, talk, and ensuing discussion. This is the second year that Saint David’s has hosted this intimate event for fathers and sons that explores what it means to be a good man, and other of our mission-inspired themes around manhood, fatherhood, and sonhood. The seventh grade is an apropos time (onset of full adolescence, pre-secondary school) to explore this special relationship through our mission’s lens.